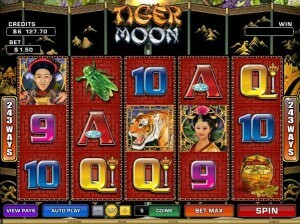 Roxy Palace Casino :: Tiger Moon video slot - PLAY NOW! Players are experiencing the magic of the ancient east in Roxy Palace Casino’s new Free spins video slot this week in Tiger Moon. The oriental theme of this big, 243 way pays game is carried by vibrant and colourful artwork depicting the dynastic age of the orient. Tiger Moons’ main attraction is its Free Spins Feature triggered by 3, 4 or 5 left to right adjacent Tiger symbols appearing on the reels. All wins from the Base Game and Free Spins Bonus can be doubled or quadrupled in the Gamble Feature. Gain great wealth, with the base game offering a top take-home of up to 12500.00, and the Free Spins Bonus up to 250000.00 on each spin! Roxy Palace Casino is among the first to offer this outstanding video slot, so prepare for the journey of a lifetime in Tiger Moon! ← Sloto’ Cash Casino :: 20 FREE SPINS – 72 HOURS ONLY!